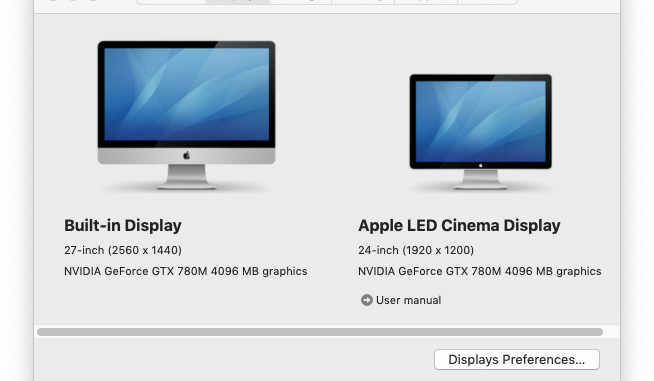 Apple has included the ability for macOS to support multiple monitors for years. 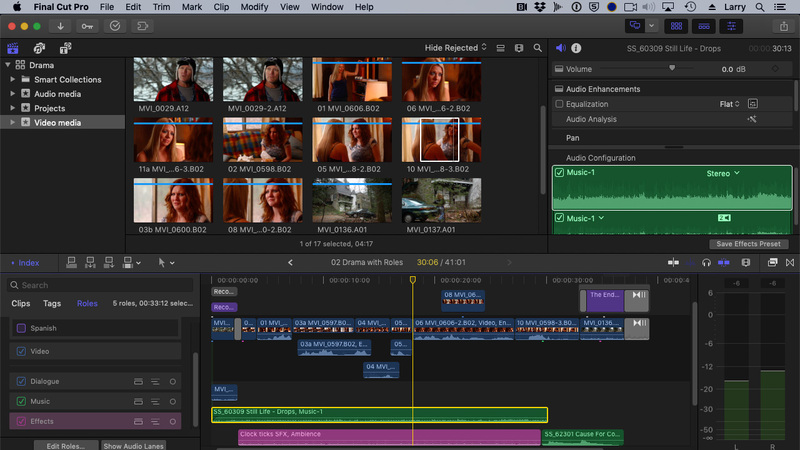 What you may not know is that Final Cut Pro X also has features that only appear when you have two monitors connected to your system. 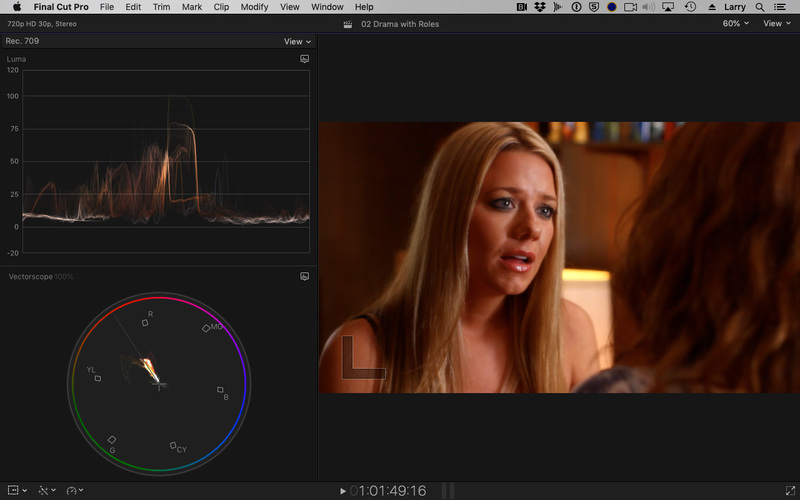 NOTE: Here’s an article on using two monitors in Premier Pro CC. Years ago, I bought an Apple Cinema Display. Aside from the fact that it is blinding with no ability to decrease the brightness, this monitor is a workhorse. I’ve used it for years. It’s attached to my main writing and editing system. 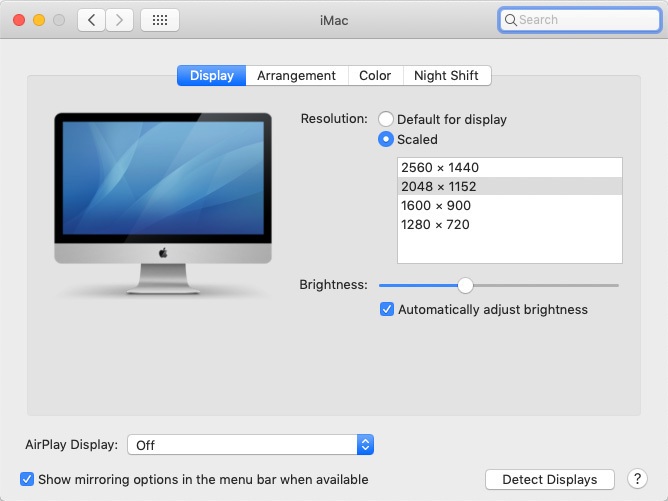 Attaching a second monitor depends upon your Mac and the display options it supports. The two most common connections are Thunderbolt or HDMI. The good news is that you simply need to connect the monitor cable to the computer, attach power to the monitor and the hardware is set to go. NOTE: You can attach any monitor with an interface suitable for a Mac. I’m using an Apple monitor in this article because it’s what I have at hand. 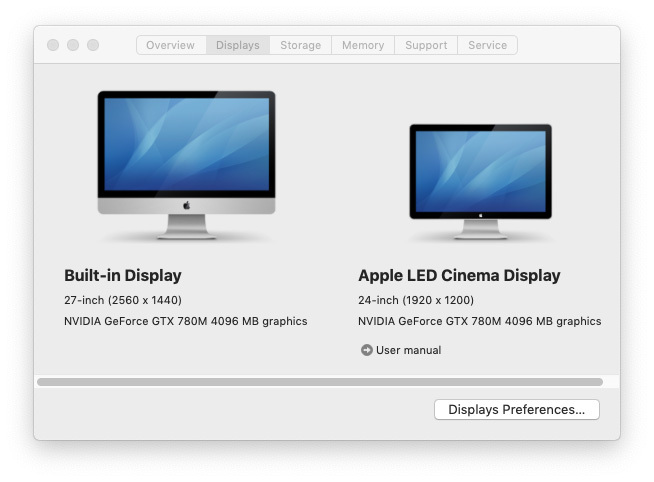 In System Preferences > Display, click Arrangement and drag the position of the second monitor to reflect its physical location. In my case, my main iMac is on a small riser, with the second monitor lower to on the left; which is what you see in the screen shot above. NOTE: This adjustment is necessary so that when you drag an object, or move your mouse, the movement between monitors appears normal. In the Display tab, adjust the resolution to your liking. On my main iMac, I’ve lowered the resolution to make the text bigger, which makes screen shots of software interfaces easier to read. This “Two Monitor” icon (on the left) appears when you have two monitors connected to your Mac. (If you don’t, it doesn’t.) When this monitor icon is gray, you are in single monitor mode. When the monitor icon on the left is blue, you are in dual-monitor mode. To enable or disable Two-Monitor mode, simply click the “Two Monitor” icon on the left. 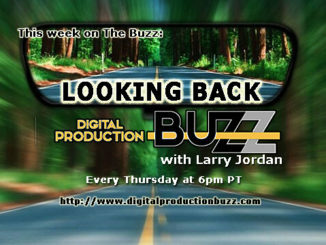 This arrow icon determines what appears on the second monitor: Timeline, Viewer or Browser. 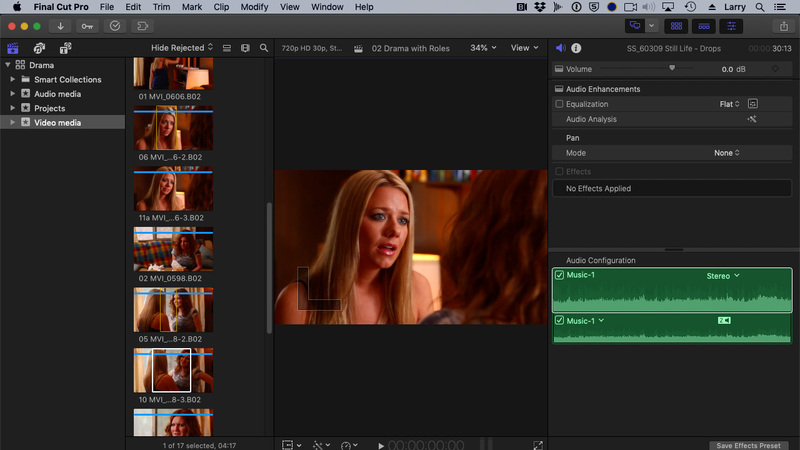 The screen shot above is what a typical single-monitor screen looks like in Final Cut, with the Timeline Index, audio meters, and Audio Inspector also visible. 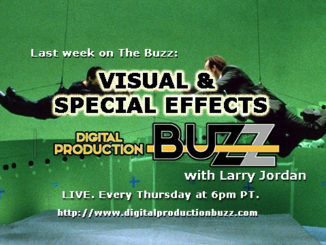 This is what the Viewer looks like, with video scopes enabled, on a second monitor. Normally, I prefer scopes placed horizontally, however, the greater real estate of a second monitor makes vertical placement much more space effective. This is what the rest of the interface looks like on the main monitor, with the Viewer on a second monitor. 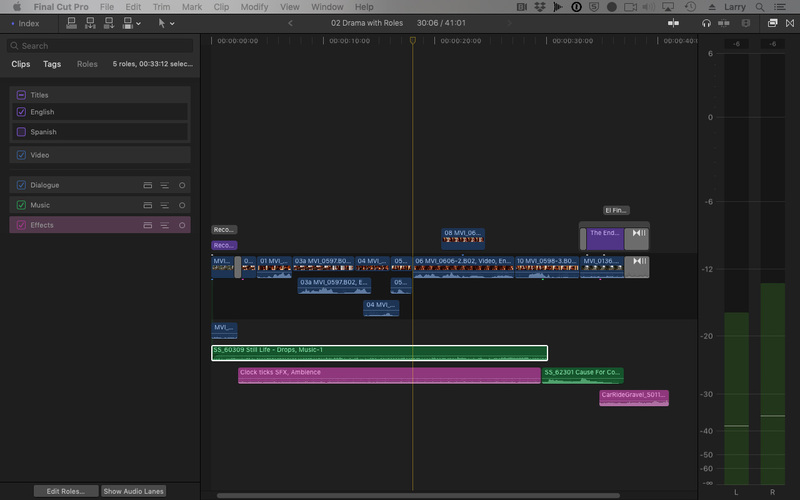 This is what the Timeline looks like, with the Timeline Index and audio meters enabled, on a second monitor. To get more room for the Timeline, hide either the Timeline Index, the audio meters, or both. 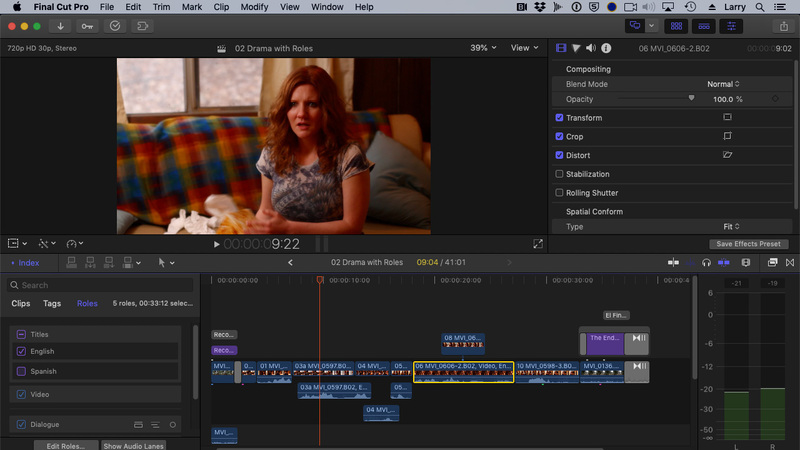 A second monitor makes working with stacked layer timelines much easier. This is what the rest of the interface looks like on the main monitor. Note that, by default, both the Browser and Inspector are full-height. Again, you can hide both the Browser and Inspector to have the equivalent of a full-screen timeline and full-screen Viewer. This is what the Browser looks like on a second monitor. This is what the rest of the interface looks like on the main monitor with the Browser on a second monitor. To switch screens from one monitor to the other, drag the Final Cut Pro X interface from the main screen to the second screen. The two images will trade places. 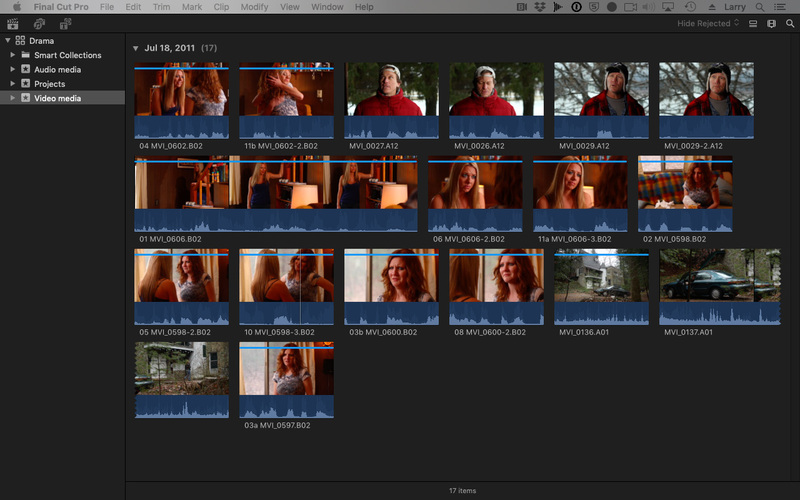 Whether to use Two-Monitor mode with Final Cut is personal preference. Sometimes, I do. 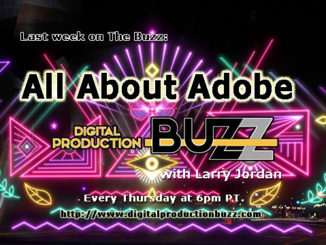 Other times, I use the second monitor to display applications other than Final Cut. But, if you didn’t know this option was there, you’d never use it. Now, you know.